When you are running your own home, you will be surprised to learn how big groceries take off your budget. Basic necessities are something that we could not do without. Whether we like it or not, we need to buy those things. Although items can be bought cheaper by the bulk, there are items that seem impractical to buy in whole. One way to save on groceries and daily items is through couponing. Coupons can be found in newspaper inserts, magazines, catalogues, blinkies, tearpads, printable coupon sources, ecoupons, online coupons and catalina printouts. Most couponing beginners do not know how to maximize their savings with coupons. 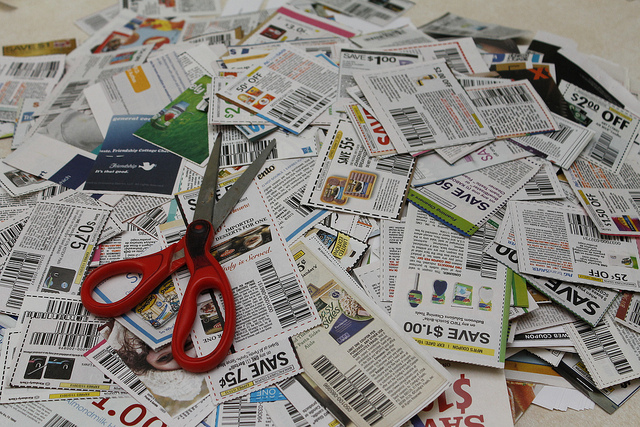 However, if you know when to use them, you’ll be surprised at how much savings you get from coupons and clippings. The trick here is to use the coupons during a sale. You will get the most savings when you use coupons on top of a marked down item. For this reason, wait for sale cycles when buying certain items. For instance, buy candies and chocolates during Valentine’s Day or Halloween season. Snacks and other finger foods, on the other hand, are best bought during Super Bowl season. Grocery items have their own sale cycles. Here is a good guide to items usually put on sale per month. Stores have different policies regarding coupon use. For instance Target has the four coupon rule which limits the use of the same coupons to a maximum of four. Walmart, on the other hand, do not have this kind of rule. Some stores allow customers to use a manufacturer coupon together with a store coupon, a term referred to as coupon stacking. This technique is particularly useful if a store does not allow double coupons on items purchased. Finally, there are some stores that accept competitor coupons. Therefore, it would be wise to save coupons on several competitor stores. When you shop in one store, bring their competitor’s coupons and ask if they accept them. This is one way for businesses to beat better deals from competing businesses. Having all those coupons for different brands and items can be quite thrilling. In fact you’d be so excited that you are tempted to stock up on items that you do not really need. Stocking up on items that you do not use on a daily basis or a brand you do not really use is defeating the purpose of couponing. You are supposed to save on daily or weekly purchases, not spend it on something that is of no need to you or your family. However, if you have recently done so, put them into good use instead. Sort out products you know you will not need or use, put them in a box and donate them to charity, your local shelter or a food bank perhaps (for food items). That way, even if you spent your money on extra items, somebody would still be able to find it useful. As the adage goes, “One man’s trash is another man’s treasure”.